The City of Orlando envisioned a performing arts center that would rival those of other major U.S. cities. That dream was realized in 2014 with the opening of the Dr. Phillips Center for the Performing Arts, a state-of-the-art facility. Only the 38th of its kind in the world based on size and scope, the center is built on nine acres with three theaters and total seating capacity of 4,700. Terracon worked in partnership with a team of more than 65 Florida-based ?rms and mentored two women-owned businesses, both of which provided inspection and laboratory services for the project. Terracon’s initial involvement began in 2010 with providing geotechnical value engineering reviews speci?cally offering design and constructability recommendations for the acoustical theater, then expanded to include construction materials testing and threshold services contracts valued at $1.5 million. Photo cou rtesy of Balfour Beatty Construction Company. Project team included Barton Myers Associates, HKS, Inc., and Barker Barrios Architects. 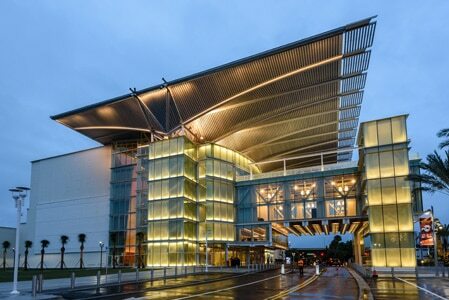 Located in downtown Orlando, the unique building exterior is de?ned by an iconic canopy roof supported by structural steel, providing a welcoming “front porch” impression. Large trusses extend 170 feet x 330 feet as a cantilevered canopy. One of Terracon’s roles for this structure was to ensure the bonds on the main trusses were adequate. To verify this, the Terracon team provided nondestructive testing, visual inspections, and bolt torque veri?cation methods to con?rm speci?cations. The trusses were constructed and inspected by Terracon in Virginia at the plant then transported in sections to the site. The Terracon team also inspected shops at two other plants to meet the demands of the project’s complex schedule. Window testing and roof inspections were also provided. Two of the three theaters are complete, including the Alexis & Jim Pugh Theater, a 300-seat, multipurpose room con?gured to accommodate theater in the round, and the 2,700-seat Walt Disney Theater. The third theater scheduled to open in the fall of 2016 will offer another 1,700 seats. Exposed steel frame, concrete, conduit, and metal ductwork were carefully positioned to reinforce the great importance these components play in each theater’s design. The 200,000 square-foot, reinforced concrete and structural steel structure is up to Leadership in Energy & Environmental Design (LEED®) certi?cation standards, which is rare for performing arts centers and theaters. The Phillips Center has been constructed to reduce water use, save energy, and promote a sustainable environment for years to come. “The Dr. Phillips Center for the Performing Arts is so much more than a place. It’s a symbol, a catalyst, and an inspiration,” said Kathy Ramsberger, president and chief executive of?cer of the Dr. Phillips Center. Terracon is proud to have been part of a community team in bringing the Dr. Phillips Center to fruition. Our team brought materials overview and recommendations to help the architects transform their designs into a contemporary work of art.